How Does A Wah Work? Are There Different Wah Pedal Types? Where Does Wah Go In The Signal Chain? How To Use A Wah Pedal? Have you gotten tired of your amp’s limited options in what it can offer to enhance your tones? If you are looking to expand upon your sound with stylish and dynamic enrichment, then a wah pedal might be the solution for you. Wah is one of the oldest and easily distinguishable must have pedal effects on the market, it has found a common use in every style of play ranging from classic rock to metal. We’ve put together a well-versed list aimed to suit your needs if you’re on the hunt for your first pedal, or you’d just like a worthy addition to your already formed setup. Articulate and very precise expression pedal is what essentially defines this model. Behringer once more delivers a best value model with this wah pedal. Designed in cooperation with Vai, this wah pedal is definitely something else. Used by the best, it delivers a performance that matches its reputation. Great combination of performance and reliability put this pedal among the best. More advanced features than usually offered, and a pretty solid core performance. A different take on wah pedals that is still very much capable. Multi-functional model that brings great quality and performance worthy of any stage. Let’s kick things off with a truly special wah pedal. Xotic Wah Effect Pedal offers a very old school experienced coming from a brand spanking new pedal. This thing is built like a tank, and on top of that, looks good enough to be framed on a wall somewhere. Even though we are living in a very technologically advanced day and age, Exotic Wah from Xotic has chosen to stick with what has been proven to work. One foot switch, one expression pedal and that is about as good as it gets in terms using this thing. What comes out of the amp is going to be a whole different story. There is range, warmth and overall organic feeling in the effect this wah produces. Even though it’s on par with some of the most legendary designs out there in terms of price, Xotic Wah is still among the most well rounded and popular wah pedals on the market. In 90% of the cases, versatility is a word you will hardly find in the same sentence with affordable. However, this is Behringer we are talking about after all. They’ve invented the super affordable segment of the market for guitar effects pedals. HB01 is their take on a wah pedal, and sure enough, it works great. While Behringer regularly cuts down on quality materials and aesthetic design, the type of performance you get makes up for any shortcomings. Behringer HB01 is an extremely versatile pedal all things considered. You can adjust anything from the feedback of the expression pedal, its heel-down frequency, and so much more. With that said, we definitely don’t recommend going hard on this way. It’s not the most solid piece of gear out there. However, if money is tight and you absolutely need a decent wah, this is the one you absolutely need to check out. Behringer has managed to hit the nail on the head once again. Steve Vai’s significance and authority is something you just don’t bring into question. Being a musician of his caliber, Vai set out to build a wah pedal which he could stand behind and use on stage. The end result comes in form of Morley VAI-2 Steve Vai Bad Horsie 2. There are several defining features about this model which make it particularly interesting. We are talking all quality components combined with the fact that you can grab one of these at a more than reasonable price. In terms of performance, Bad Horsie 2 is up there with the legends. Aside from being extremely accurate and precise, it also allows you to choose between Contour and Bad Horsie mode. Each has its own benefits and drawbacks, but we definitely love the amount of range you have when dialing in a Contour mode solution. At the end of the day, it’s really not as surprise to see the Bad Horsie 2 get everything so well considering who designed it. We’re going to dig deep into the roots of the “wah” effect once again, henceforth rises the Fulltone Clyde Standard. Based on Clyde McCoy’s well-known original wah pedal – which was a favorite of Jimi Hendrix, Eric Clapton and many more. This pedal borrows outstanding features from previous releases, and takes upon improving Vox-based inductors, which serve as an integral part of any wah pedal. This wonderful piece of work reproduces breathtaking classics in a heartbeat, coming with a much wider than usual sweep range it presents much welcomed versatility when you hammer down the footswitch. If you don’t like the default volume tone you can easily tune it with a knob featured on the interior side. This pedal offers more than your regular wah, it’s pretty tough and it poses no threats when it comes to durability, it highlights the manufacturer’s attention to detail and quality, well worth its price and comes deservedly as a recommended pick. It just so happens that Vox was also heavily involved in the early development of wah pedals. This definitely explains why they’ve been in hot pursuit of that pole position in this segment of the market. Vox V847A is among their most popular and most trusted models. It’s a beautiful looking wah that comes in a sturdy, professional grade enclosure. the pot is a very responsive unit that will give any other elite wah a run for its money. In terms of tone, you are looking at a dynamic range that is available instantaneously. Again, this is among the most basic models, which doesn’t mean you get a cut down on performance. On the contrary this pedal is void of any necessary feature and offers pure wah experience to those who appreciate simplicity. One of the best traits of the V847A is its price. This is considered to be a beginner model, and thus comes at a reasonably affordable price. Considering the fact that MXR is owned by Dunlop, and that the latter has been producing top tier wahs for decades, it’s no surprise that MXR MC404 CAE Dual Inductor wah represents something truly special. 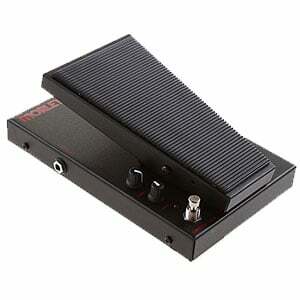 We are talking about a sturdy, reliable wah pedal which comes with several modes of operation. You can choose a standard vintage setting which will give you the type of wah tone you can hear on many legendary rock hits. On the other hand, you can also choose a rather warm and ‘wide’ wah that is more contemporary. This fusion of new and old, iconic and innovative, is among the biggest reasons why the MC404 represents one of the best wah pedals on the market at the moment. With all that said, the pedal itself is built like a tank, using only the type of components and materials capable of withstanding the mayhem of frequent stage use. That alone makes it more than worth the investment. Since Ibanez entered the wah game somewhat late, they’ve decided to take a route that was vastly different from what most of the competition was using. Ibanez WD7 is a rather impressive design, which incorporates a number of interesting features. Aside from the standard expression pedal you also have range switch that enables you to choose whether you want to work in the higher end or lower end of the frequency range. On top of that, it comes with several tone shaping controls which you can use to dial up the perfect wah tone you’ve been looking for. It might not be as glamorous as some of the models we’ve mentioned so far, but it’s really hard to beat the WD7 when it comes to practical use. Ibanez WD7 Weeping Dragon is all about performance over anything else. That is why so many guitar players prefer it over the more traditional wah pedals out there. In some ways, adding the AW-3 by Boss is pure cheating. This pedal is more of a harmonizer which does a great job at imitating a decent analog wah. When some sees the AW-3, the last thing they are going to expect is for it to be a standard stompbox and a stompbox centered around the expression pedal. With that in mind, you can plug an expression pedal into this wah and use it in a more standard way. If that is not possible, Boss AW-3 allows you to setup all of the parameters of your wah in advance, and then just stomp on it when you need it. In terms of tone, there is a lot of clarity and definition, all while the pedal doesn’t really sound that artificial. On the contrary, you are getting a rather organic sounding wah in an extremely compact package. 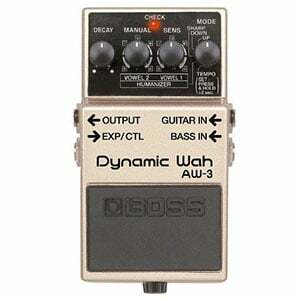 In terms of price, Boss AW-3 is right there in the sweet spot. It’s affordable enough for budget. Soul Press SP-10 is a very interesting type of wah pedal. Instead of going for a more modern design and purpose, Hotone limited the SP-10 to a tone which closely resembles the original Crybaby wah. I wouldn’t go as far as to say that it’s a knockoff, but more like an homage. Looking at its chassis, we quickly noticed a somewhat robust bust still easy to use. That weight and size come from Hotone refusing to give into modern trends. Many have tried to replicate the Crybaby wah, but not many have succeeded. This SP-10 is one of those few who did. SP-10 is something we could easily recommend to a beginner. It’s a relatively affordable unit with a lot of potential that just waits to be tapped into. 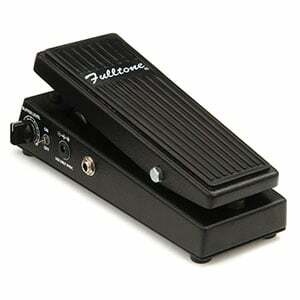 If you are on a hunt for your first wah pedal, we strongly suggest that you look into this Hotone. This is especially true for those who are operating on an extremely tight budget. The origin of the wah effect dates back from the early 1920’s, when music players experimented with muted trumpets which resulted in the creation of an expressive “crying baby” tone. The earliest guitar effect pedals came much later on, in 1966 – The Clyde McCoy, the Cry Baby and the Vox. Among the first adopters of the earliest wah pedals were Eric Clapton (who was a part of Cream at the time) and Jimi Hendrix, both released official recordings in 1967 while using their wah pedals, which aided in their rise to fame. Wah pedals are extremely simple devices when you really look into it. In simple terms, this pedal allows you to push your guitar into mad screams, deep dives and anything in between by simply manipulating the expression switch on the pedal. If that explanation isn’t really satisfying, we can go deeper. In a more technical sense, wah pedals are manual bandpass filters. Under the expression pedal is a switch whose purpose is to eliminate specific frequencies depending on its position. The whole thing started when someone wanted to add more versatility to mid range boost features that were frequently build into amps. The idea is that instead of just being able to turn that boost on or off, you could actually explore values in between by using a potentiometer instead of a standard switch. Needless to say, the new effect became incredibly popular in a fairly short amount of time. Almost as popular as early standalone overdrive pedals. Despite being so simple in nature, wah pedals expand the creative freedoms of a guitar player in a very significant way. This partially explains why some of the most legendary guitarists in history always used and still use a wah pedal. Hendrix did crazy things with nothing more than a fuzz box and a wah pedal. If you are interested in spicing up your tone, wahs are a very solid place to start. Lets find out just how practical they are these days. With some effects pedals, there will always be an argument regarding whether or not that specific pedal is still relevant or practical. Wahs are among those that don’t suffer from such issues. Despite it being one of the oldest guitar effects we know of, wah pedals are going strong as ever. Truth be told, you will notice a wah in specific genres of music, but that doesn’t mean it is exclusive. On the contrary, wahs are used in just about any genre that includes a guitar. We are talking anything from really heavy metal to blues. It all comes down to your personal preferences, imagination and understanding of how wahs can help your tone. Even if that tone is saturated with a heavy distortion. It also helps that wahs are generally not that expensive, nor are they complicated for use. As a result, we see more and more beginners opting to get a wah on their pedalboard as one of the first choices. So, to answer the question from the title, wahs are very much practical even to this day. Chances are that a wah will be one pedal you can always fall back to when you need to spice things up. When you look at just about any other effect, chances are you will see a variety of subcategories all of which add a flavor of their own. With wah that isn’t really the case. Since simplicity is kind of the whole point of a wah, there aren’t wild differences between various models. That however doesn’t mean that there are no differences at all. The first classification of wah we’d like to talk about are standalone and combo pedals. The principle of operation behind a wah has proven to be practical for more than just this single effect. Therefore a number of different brands have started designing and producing pedals which are multifunctional in nature. Some combine wahs with volume pedals while others can serve as expression pedals. As a matter of fact, there are pedals with a triple functionality built into them. The real question is whether you should stay away from these and go for a standard wah? That will depend on what you need or want. Usually a pedal that is jack of all trades is master of none just like that old saying states. However, there are examples where versatile and multifunctional nature of a wah was actually its strong suit. Again, which one you’ll want to go for will depend on your needs and your budget. In terms of pedal placement, wahs are pretty straight forward. The current standard is to place the pedal at the very beginning of the signal chain with only tuners possibly being placed between a wah and your guitar. Reasoning behind is simple. Filtering the raw signal will yield much cleaner and crisper results than it would to push a signal saturated with all kinds of effects through a filter. Makes perfect sense when you think about it. There is also a small group of people who insist on doing exactly that. In other words, they are placing the wah at the very end of the chain. Using a wah is generally all about the sweeps. After all, that is what wahs are best known for. The speed and intensity of the sweep is fully up to you. With that said, there are some unwritten rules that can help you get the effect you need with the least amount of effort. In order to execute a great sweep you will want to sync it with the tempo of your song. This can’t be stressed enough. If you miss the temp of the song, your sweeps will sound fairly out of line. Delayed sweeps are also a thing. This technique dictates that you should initiate a sweep only after you have already picked a note. That way you are not driving the sweep along with the note, but instead pushing an already played note. The main benefit of pushing a sweep is the fact that it adds weight to the note it is driving. You can use this as a tool to accentuate certain parts of your song. If you’ve set your mind on grabbing a wah pedal, you’ll definitely find one or more matching your taste covered on our list, as we’ve carefully formed the best selection in terms of price and quality. Great article and suggestions, but you forgot Zappa in the original wah-ers! The Vox v847 wah is considered a beginner’s pedal? Since when? It is well known that many of the legendary guitar greats like Hendrix, Clapton and many other professionals used the Vox wah pedals on many of their classic recordings. The Vox wah is a legendary pedal and the Vox v847 continues that legacy. Modern wah pedal makers take inspiration from the Vox wah and the CryBaby variants. Lets be honest, the Vox wah is a legendary pedal that is for all who want to use it, from beginners to legends. Its history supports its legend status. Keep up the good work guys. Epiphone Les Paul 100 vs Epiphone Les Paul Standard – Battle of the Axes!